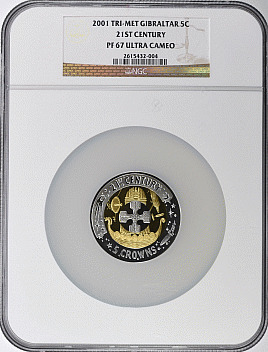 With a limited mintage of only 199 pieces, this gold/silver/platinum coin is rarely offered on the market. Contains 2.36 oz. of gold, 0.865 oz. of platinum and 1.64 oz. of silver. Impressive. Description: With a limited mintage of only 199 pieces, this gold/silver/platinum coin is rarely offered on the market. Contains 2.36 oz. of gold, 0.865 oz. of platinum and 1.64 oz. of silver. Impressive.